Kaoru Amane is a 16-year-old girl who suffers from a rare genetic disorder known as xeroderma pigmentosum—a condition in which even the smallest amount of sunlight will cause irreparable damage to her skin, potentially ending her life. As a result, she is confined to her house during the day, while venturing out into the city only at night to play her guitar and sing in front of the train station. During her time spent indoors, she watches a young boy from afar and yearns to talk to him. Through her cousin's efforts, Kaoru finds out that the boy's name is Kouji Fujishiro. Eventually, Kaoru runs into him during one of her nightly adventures, their first meeting cementing her feelings for the boy she has always longed to be with; however, as the girl begins to fall deeper in love, her complicated illness is certain to bring some hardships. 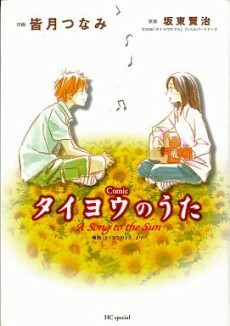 Note: Taiyou no Uta is based on the Japanese film of the same title that was released in Japan on June 17, 2006.